The federal polling averages for the month of November bring up what could be an important question next year: was this the moment that Stephen Harper set himself back on track for re-election? While the Conservatives still trail Justin Trudeau's Liberals (for the 20th consecutive month), the numbers they put up in November were the best they have seen since before Trudeau became leader. A total of five national and one Quebec poll was conducted during the month of November, totaling 15,672 interviews. Note that I have included the recent Ipsos Reid poll in the November averages. Though my usual practice is to only base a poll's inclusion in a given month on its last day in the field, the Ipsos poll required that an exception be made. The poll ended on December 1, but 96% of it was conducted during November. The Liberals led in November with an average of 34.7% support, down 0.9 points from where they stood in October. This is the fourth consecutive month of stagnation or loss for the Liberals, who were at 39% in July. The Conservatives gained 2.5 points to reach 32%, their best since February 2013. The New Democrats were down 0.8 points to 21.7%, while the Greens were down 0.4 points to 6%. Support for the Bloc Québécois was at 4.1%, and 1.4% of Canadians said they supported another party. If we compare this month's numbers to past averages in November, we get an interesting look at how things have been shifting over the last five years. The overall Conservative drop and Liberal gain is clear, as is the fact that the NDP is still well above where it was prior to the 2011 election. And the downfall of the Bloc is stark. The Conservatives and Liberals were tied in British Columbia for the second consecutive month, each with 32.1% support. That was a gain of 0.6 points for the Tories and a pick-up of 0.3 points for the Liberals. The NDP was up 0.5 points to 23.6%, while the Greens were down a point to 10.2%. In Alberta, the Conservatives averaged 57.5% support, a gain of 7.4 points and their best numbers since January 2013. The Liberals were down 3.8 points to 20.9%, their lowest since April 2014, and the NDP was up 2.5 points to 14.1%. The Greens were down 4.5 points to 5.4%. The Prairies have been remarkably stable of late, with the Conservatives at 39.3% (they have been at 39% for three consecutive months) and the Liberals up one point to 32.2%. The party has been between 31% and 33% for the last five months. The NDP was down 4.7 points to 19.5%, their lowest since April 2014. The Greens were up 3.7 points to 7.9%, their highest since May 2013. The Liberals have reverted to the level of support they consistently showed in Ontario between August 2013 and June 2014, falling 2.3 points to 38.1%. The Conservatives were up 1.5 points to 35.7%, their best since January 2013. The NDP was down 0.7 points to 18.9%, and over the last five months have been at their lowest level of support in the province since before the 2011 election. The Greens were up 0.4 points to 5.3%. In Quebec, the Liberals were down 0.7 points to 32.2%, their lowest since June 2014. The New Democrats were down 1.4 points to 29.7%, continuing their steady run now stretching to 11 months in which the party has managed between 28% and 31% support in Quebec (with the fleeting exception of June, when the party was at 34%). The Bloc was up 1.1 points to 16.9%, while the Conservatives were at their highest since January 2013 with a gain of two points to 16.3%. The Greens were down 0.2 points to 4.1%. And in Atlantic Canada, the Liberals were up 2.5 points to 51.2%, the Conservatives were up 1.5 points to 23.5%, and the NDP was down 0.9 points to 20.6%. The region has been among the steadiest in the country. The Liberals have averaged between 49% and 52% over the last six months, while the Conservatives have averaged between 21% and 24% over that time. And for the last 14 months, the NDP has been stuck at between 18% and 23% in the region. The Greens averaged 4.3% here in November, down 2.8 points from last month. With these levels of support, the Conservatives barely win a plurality of seats despite trailing in the popular vote by almost three points. They'd take 133 seats, a gain of 11 since last month, while the Liberals drop eight seats to 128. The NDP would win 74, down three, while the Greens and Bloc would be unchanged at two and one seat, respectively. The Conservatives picked up six seats in Ontario, three in the Prairies, and one each in Alberta and Quebec. The Liberals dropped seven seats in Ontario and one in Alberta. The New Democrats dropped three seats in the Prairies and one in Quebec, but picked up one in Ontario. With now less than a year to go before the vote is held (and even less if you listen to some of the chatter in Ottawa), the lay of the land is shifting a little. The Liberals still lead, but the Conservatives are now in a position where they could plausibly come out ahead in seats. The New Democrats are still an important factor, but are now 10 points out of second place. Of course, that is where they were before the campaign kicked off in 2011, but it seems unlikely that a party can pull off the same trick twice. While there is still a lot of potential for movement, it may take the campaign to get things really unstuck. The Conservatives polled an average of between 33% and 38% in the 11 months before the 2011 campaign got started, while the Liberals were steady at between 26% and 30%. Before the NDP's breakthrough, they wouldn't budge from a range of 15% to 18%. If we apply those +/- to current numbers, we'd get the Liberals at between 31% and 39%, the Conservatives between 27% and 37%, and the NDP between 19% and 25%. By that standard, the next 11 months may look a lot like the last 20. And then the campaign starts. conservatives were at 33% in the November before the 2011 election where they managed almost 40%. they're at 32% now. don't underestimate their ability to 'peak' at the right time. So the polling averages in Ontario are 38 liberal 36 CPC. Results were 49 - 41 add 1 to the Lberal and 5 to The CPC. and you end up with CPC 40 and Liberal 39. At this point in time ... with Trudeau still in the exhibition season of his rookie year. "but the Conservatives are now in a position where they could plausibly come out ahead in seats"
is either questioning the veracity of your model or showing your bias against the CPC. "but the Conservatives are now in a position where they would likely come out ahead in seats"
I am exercising caution, because the polls included in the averages and the seat projection model itself are subject to sources of error. If I had ranges to these numbers, as I will once the projection model is officially launched, the CPC and LPC would be overlapping quite a bit. At that point, it becomes a coin-toss. 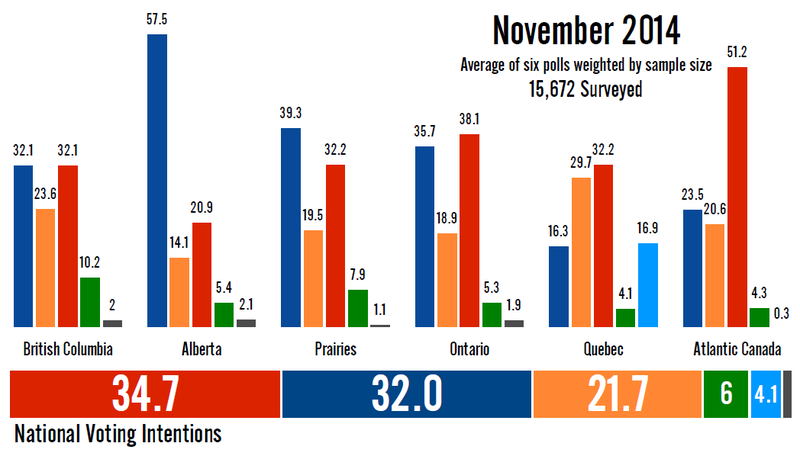 So the question is why the change in the polls if there hasn't been any big move from the CPC as of yet? I have to candidate hypothesis (1) the economy continues to improve, which tends to help the incumbent and (2) on the face of the parliament hill attack people close ranks around the current government. Observe that depending on the correct explanation the trend goes in completely different ways. 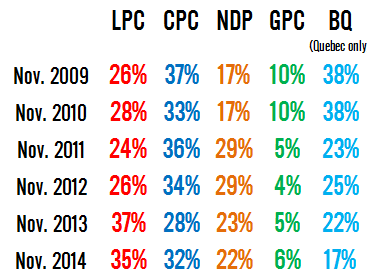 If the CPC is up because of (1) they'll do even better in the months ahead. On the other hand if it is because of (2) they will be back down to where they start. I'm not making any bets right now as of which of (1) or (2) is the case. We'll have to wait and see. Liberals need to start blaming Trudeau for his lacklustre performance both inside and outside the House. The "allegations of harassment scandal" has devolved into farce as have some Liberal nomination contests. The public are rightly asking; "where are his leadership attributes"? His lack of policy publications only adds to the perception of someone who refrains from the necessary hardships of being a leader. Those are CPC talking points that have little to do with reality. As time goes by the more measured and reasonable his decision to suspend the involved MPs seems to be. Not rush to judgement but neither avoid action. Suspend, create a framework to investigate and let the facts come out. There is no reason for him to release his platform just yet. Why give the CPC a target a full year before the election? People already know what the LPC stands for: a centrist moderate party that mediates between the NDP and the CPC positions. More like LPC talking points Polstats. How can you allow fundamental judicial principles such as the presumption of innocence and the rule of law be trampled upon? Haebeas corpus is ignored since, no charges have been laid although, technically since the M.Ps are not imprisoned the point is mute. And what of the safety of parliamentary staff? If these M.P.s are as the allegations suggest Trudeau has put parliamentary staff in danger. How can anyone defend Trudeau's decision not to favour the presumption of innocence and to withdraw his M.P.s right to a fair trial? More importantly he allowed Mulcair to make decisions involving the Liberal caucus for him! If Trudeau wishes to follow Mulcair he should join the NDP! There is a framework it is called the House of Commons, If the NDP M.P.s had a case they should stand in the House and make their accusations public, then the House in its capacity as a court may rule on the matter! How can you deny justice and ignore the rule of law? And why does Trudeau allow M.P.s to be treated differently than other Canadians? One must draw the conclusion Liberals and Dippers expect one set of rules for themselves and a completely different set for other Canadians. He has allowed unproven smears to decide judgement while at the same time deny his M.P.s the right to present a defence! Trudeau's actions harken back to a day before 1215. As for the platform; politicians who respect Canadians don't need to hide their policies, well thought out policies will speak for themselves. Politicians who respect Canadians are not afraid of debate! Politicaisn who can not manage a single policy except "legalise it" then hide behind presumed Conservative attack in order to keep their motives, ideas and policies private simply don't believe their policies are defensible. Your line about the Liberals mediating between the NDP and Tories is utter nonsense. Can we assume then that the Liberals will return to deficit albeit a lower deficit than a NDP government would produce? In any case history does not support such a claim the Liberal deficit cutting of the 1990's was Ross Perrot right-wing not middle ground. Canadians have a right to know who and what they are voting for, unless you're an elitist who think the Liberal party knows better than Canadians? I am glad things are shaping up for this to be a disastrous election for the LPC. It was a noble party but, it lost its way preferring power over people. A leader known more for his hair than policies is merely the latest sympton in a remarkable decline that began with his father. It is the inevitable result for a party controlled by elitists not the grass roots. Presumption of innocence applies to criminal proceedings and nothing else, not even civil cases. That you are ignorant of such basic fact disqualifies the rest of your equally uninformed comment. Your comment demonstrates you do not understand the difference between criminal and civil law. The CPC in 2011 demonstrated serious competence in putting resources into races where it counted and will most likely continue that winning strategy. The big problem for the CPC is in Ontario where the LPC has been gaining from the NDP. A 2-3% shift is very big in tight three way races. The second problem for the CPC is BC where Northern Gateway has been costing them. Ontario 905 will likely decide the election. Northern gateway is not an issue except in Vancouver and some inner suburbs. As the 2013 BC election showed the BC Interior strongly supports resource development. The Layton Seats that the NDP took away from the BQ ALL go Liberal rather than back to the BQ? 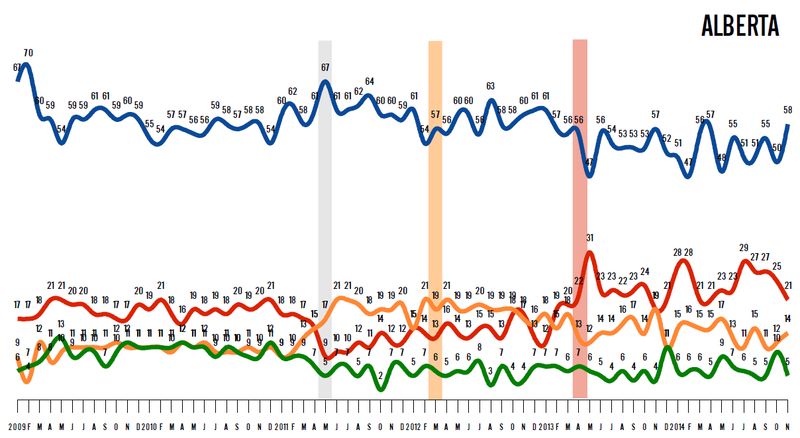 The CPC support in Quebec looks a little better the NDP support did 11 months prior to the 2011 election. With the Couillard government actually introducing the Quebec population to fiscal responsibility the Conservative ideology is not as unfamiliar in Quebec as it has been for the last 3 decades. When you get 10,000 students and unionists in the street blocking traffic it would generate many more times the people who might quietly express their opposition to the protesters at the ballot box. At what point does the CPC generate a significant seat count? If 18% gets 9 seats does 23 % get 25 or more seats? It's called a political death wish. Don't bother coming in cause the water sure ain't fine in Austerity Ocean...after PKP gets the PQleadership, Couillard will learn the same lesson Pauline did. Think goodies or meet defeat. 25 seats for the Liberals in the west far exceeds any seat count the Liberals have gotten since 1949... other than Manitoba voting in 12 non-Mulroney in 1993 and The original Trudeau-mania in 1968 both times giving the liberals 27 MPs from the west. Trudeau getting 25 seat in the west would be the same sort of thing as Harper getting 25 seats in Quebec. 25 seats out West is speculative. History shows the Liberals have a tendency to perform well between elections out West only to fall back down to Earth on election day. I have nothing against Eric's model but, it is only as good as the numbers it is given 15 seats in BC just isn't going to happen, 3 seats in Alberta is unlikely. 7 seats on the prairies is slightly more plausible but on the high side. Even with these numbers the Liberals would do well to win 15 seats out West. Éric isn't predicting the election. He's projecting seat allocations based on current polling. That's a very different thing. I am well aware what Eric is predicting which I why I wrote; "I have nothing against Eric's model but, it is only as good as the numbers it is given". I would note however, tha a universal swing model would reward the Liberals with about 5 fewer seats in BC than Eric currently predicts and would give the Greens only 1 seat. While 25 would be a jump, it's not as historically- monumental as your numbers imply. Don't forget that there are roughly 50% more seats in the West now than there were a generation ago. Take 1974 - 13/68 would be 20/104 today. Obviously, it would be a good take. However, saying Trudeau is, generally, doing well is bleedingly obvious. Your analysis suggests he's doing improbably well. I think that it's not really that off-the-chart. It would be a historical achievement for the Liberals. As BCVoR states above the Liberals best seat performance was 41 seats under St. Laurent and 27 seats in 1968 under Trudeaumania and 27 under Chretien in 1993. Therefore, 25 seats would be their third best performance in the last 65 years which is pretty historic considering since 1949 Liberals average only 12 seats out West during elections and average only 14 seats per election since 1993. Trudeau is doing improbably well out West and I suspect come election time his numbers will return to historical averages. Trudeau has no plan, doesn't trust Canadians enough to release a platform and frankly his handling of internal party conflicts is embarrassing. Why are Sikh separatists fighting over a Liberal nomination in Vancouver? Such politics have no place in Canada. Trudeau and Liberals blind support for the 1982 Constitution has lead to indefensible judicial decisions such as; supporting Aboriginal rights above the right of life-saving medical treatment for a child and will likely uphold prejudiced Mohawk by-laws stripping residency rights from any Mohawk who doesn't marry a Mohawk; the so called "marry out move out" bylaw. The Liberal "ideal" of radical parallelism is simply wrong and unjustifiable and it shows the weakness of the 18th century document PET foisted upon Canadians. Fundamentally it shows the weakness of the whole philosophy that the document embodies; laws empowered by elites instead of the people. In any case I am fairly confident young Trudeau and the Liberals will be badly beaten in the next election. While the Liberals' numbers in the West do seem improbable, their performance in the by-elections in Fort McMurray-Athabasca, Macleod, Brandon-Souris, and Provencher were surprisingly good. For that reason I don't consider their numbers out West unreasonable. You are putting too much faith and value in by-elections. All those two by-elections demonstrated were that Liberals were able to get out their voters. Macleod had a by-election turnout of 19%; Brandon-Souris 44% (still down some 13% from the general election), Provencher 33% turnout or about half the usual vote during general elections, With Fort Mac turnout at 16%. By-elections are strange beasts and attract a distinct demographic of voters that is dissimilar from the general voting population. With the current numbers do the Liberals win Fort Mac, MacLeod, Brandon-Souris or Provencher in your projection? Jack's personality won over Quebecers in 2011 and Mulcair looks to be holding on in Quebec. Your comment seems to posit that Steve's personality is about to win over Quebecers as did Jack's. I feel the Libs won't get those seats in Ontario or the West. They can easily take Toronto and the inner suburbs back, but I think ppl in the 905 (where I live) aren't upset enough to vote off the CPC. The area has. Even growing and people are generally well off. I can't even see Fantino losing my riding despite his debacle (Veterans affairs does not seem to interest Vaughan Woodbridge). I also can't see Bal Gossal or Parm Gill losing their ridings, or Pat Perkins now that she's the incumbent. As for the West, 4-25+ seats is a massive jump. Maybe JT can win 10 seats in BC (which would already be more than doubling LPC seats there). Also can't see 3 Lib seats in Alberta and think that CPC lead looks way too short for the Prairies. I mean, people love Brad Wall (conservative) and Manitobans seem to want a PC government. 10 seats in BC would be the most Liberal seats in BC since 1968 (Trudeaumania). and Saskatchewan and had 2 members from Manitoba. Not even Chretien was as un-electable as Trudeau was in the West. It will be interesting how the Trudeau name plays out in the West when it comes time to campaign and vote. I think we want Liberals "excited" and over confident in order for them to ignore the hard realities of politics. Despite what Jeffrey Simpson wrote yesterday a plurality of seats is enough for Harper to continue at 24 Sussex, at the moment the planets look to be aligning in favour of a re-elected Conservative government. -Can you tell us how many undecided People are before vs after ottawa attaks? -did the attaks influenced the undecided to polls for the gouverning party? It does not seem that the number of undecideds changed to any great degree. Justin at the moment is running in a bit of a "dark" area. Party has not released any real policies or ideas. I don't expect to see anything until early in the New Year. It's only sensible for two reasons. First it is the holiday season and nobody is listening to politics except Fantino and why start a slagging war when the vote is so far away. Expect stuff early next year IMO. Apparently one idea some Liberals in BC have is to engage in party infighting over nationalist movements in foreign countries. If Justin has a policy on an independent Sikh homeland he should release it! You may want to update your model to 338 seats. If Oil stays the way that it is and the economy suffers because Harper didn't diversify I think the Cons can kiss the gains they've made the last few weeks goodbye. I think you mean because the Liberals didn't diversify. You can't expect any government to diversify the economy over 8 years. The Liberals were in power for most of the 20th century and during that time they continued to allow Canada to be hewers of wood and drawers of water. In any case "diversification" and resource extraction fall primarily under provincial jurisdiction. Harper has done a remarkable job diversifying and expanding Canada's trade relationships through free trade agreements with Chile, South Korea and the EU. Michael den Tandt piece in today's National Post points out that not only Justin has NO policies. In fact the three major parties are all alike with virtually nothing on offer.